Null-cell carcinomas of the pituitary are extremely rare. We describe a 41-year-old woman with a large adenohypophyseal neoplasm presenting as a primary nonfunctioning tumor without pituitary insufficiency. Signs of mass effect with progressive unilateral ocular motility disorders and anterior pituitary failure developed rapidly. Histopathological examination of the trans-sphenoidally removed tumor showed a primary pituitary null cell tumor with high mitotic index. 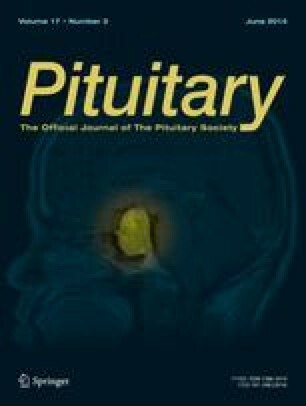 Pituitary carcinoma was suspected because of rapid relapse of ocular motility disorders and of intra-sellar tumor growth after surgery. Radiotherapy of the sellar and parasellar area with a total dose of 59.4 Gy was performed, achieving marked tumor reduction and a significant improvement of ocular motility disorders. However, 6.5 months after presentation the patient rapidly declined and died of carcinomatous meningitis. Less than 100 pituitary carcinomas have been published so far, most of them as single-case reports, and endocrine, immunohistochemical, and ultrastructural data have not been described in the majority of cases. At presentation, there are no specific symptoms that allow to distinguish benign from malignant tumor. Prognosis is poor, since no curative treatment has been established, but aggressive surgery and radiotherapy has been recommended. Our case highlights the poor prognosis of nonfunctioning pituitary carcinomas.